1) Hype and hope of a Greek deal. 2) China has stopped trading of 49% of stocks and threatened to arrest anyone who is short-selling the market (talk about a backstop!). Regarding Greece, no deal has been made. Greek PM Tsipras has submitted a proposal for a new deal… which is almost EXACTLY the same as the deal that 61% of the Greek population rejected via referendum last week. Tsipras has completely backed himself into a corner. He used up a lot of goodwill with EU officials when he let Greece default by staging a referendum for Greek voters AFTER the due date on Greece’s debt. The voters obviously voted “No” on the EU’s deal… so Tsipras has had to come up with a new proposal. The only thing he can suggest that would possibly sit well with Greek voters is “debt forgiveness,” which Germany has stated it is absolutely opposed to. So now Tsipras must decide… does take a bad deal (the same one voters said “no” to last week), which will force a popular revolt in Greece (and likely his expulsion from office) or is he the man who takes Greece out of the Eurozone? His finance minister has already quit his post… and doesn’t seem too upset about it. Perhaps Tsipras will follow suit, Greece will elect another PM and the whole charade can start all over again? The Greek drama has engaged in “extend and pretend” for five years now. It’s highly likely that it will continue this time around with Greece accepting a bad deal and plunging further into economic collapse until the next debt problem emerges. Anyone who bothered to look at the actual data coming out of China (the un-massaged data, not the fictitious GDP numbers), knew the China economy was in collapse. It was only a matter of time before its stock bubble joined suit. Sure enough, the bubble burst, and the Chinese stock market has erased over $3 trillion in wealth in the space of three weeks. The market is bouncing on this… it’s now coming up against the first line of resistance (blue line) established by the uptrend from late 2014. If we break above that we could even bounce to retest the longer-term bubble bull market trendline (green line). However, after that we’re heading DOWN in a big way. The bubble has burst. Bubbles NEVER reflate after bursting. Crises never unfold in straight lines. Investors forget that when the Tech Bubble burst, stocks were a roller coaster with over EiGHT moves of 16% or greater in the span of six months. China’s bubble was even larger than the Tech Bubble. The price volatility will be even more severe… but the bubble has definitively burst… and the market will be heading lower in the coming weeks. In short… the two biggest reasons for the markets to be rallying today (Greece and China) are simply temporary issues. They will resolve, very likely for the worse, in the coming weeks. Smart investors should be using this bounce to prepare for the next wave of the Crisis. If you’re looking for actionable investment strategies to profit from this trend we highly recommend you take out a trial subscription to our paid premium investment newsletter Private Wealth Advisory. An exclusive from Phoenix Capital Research: The Greek drama continues. Greek Prime Minister Alexis Tsipras states publicly that he is confident that a deal will be met because Greece is willing to compromise. Tsipras then refuses to compromise behind closed doors with EU officials. Tsipras tells the media and Greek citizenry that the EU is evil and is attempting to enslave Greece. This process has been maintained for over five years now. This only further illustrates one of my central themes: everything in Europe is about politics. Europe as a whole is socialist in nature. You will never hear a discussion of “how involved should the Government be in the economy?” in most of Europe; it is just assumed that the Government should always be involved a large degree. The question is whether it should be a lot (the public sector accounts for 30% of jobs in Germany) or almost entirely (the public sector accounts for 56% of jobs in France). When more than one in three people are employed by the public sector in one form or another, everything is driven by politics. The best example of this, of course, is Greece. The Government attempts to employ as many people as possible even if it makes absolutely no sense to expand the Government workforce. The Government pays WAY above what the work requires (on average public sector wages are 150% of private sector wages and most employees receive pensions equal to 92% of their salary at retirement). Greek culture not only embraces, but celebrates tax evasion (so there is little Government revenue to finance all those overpaid bureaucrats). The level of fiscal insanity goes above and beyond anything you’re likely to see. Consider the Greek metro system. It takes in €80 million in annual ticket sales… and spends over €500 million in salaries. There is a word for an entity that spends over SIX times its annual revenues on employee salaries… it’s bankrupt. This sort of scam is endemic in Greece. Anyone from pastry chefs to hairdressers and other services-based sectors can retire at age 50 and receive a pension equal to 95% of their salary. Suffice to say, the Government payouts are extreme. Unfortunately, Greek taxpayers don’t want to fund it. Greece has a population of 12 million. Less than 5,000 of these individuals report taxable income of more than €90,000. Put it this way, less than 0.01% of the Greek population claims they make more than €90,000 per year in salary. This for a country that has over 60,000 individuals with investments of over €1 million… and those area simply the individuals willing to admit it! The effort that goes into this subterfuge is staggering. In 2010, the Greek tax authorities began using satellite imagery to target Athens homes with swimming pools (a sign of wealth). Only 324 Greeks claim to have such homes in Athens. The satellite study found nearly 17,000 homes with pools before an enterprising Greek began selling pool covers that look like a normal lawn. Simply put, in Greece we have a bloated bureaucracy that pays exorbitant salaries and pensions in a culture that goes to great lengths to hide its wealth/pay taxes. Greece however is not the REAL issue for Europe. The REAL issue concerns the derivatives trades that are backed by Greek debt. Modern financial theory dictates that sovereign bonds are the most “risk free” assets in the financial system (equity, municipal bond, corporate bonds, and the like are all below sovereign bonds in terms of risk profile). The reason for this is because it is far more likely for a company to go belly up than a country. Because of this, the entire Western financial system has sovereign bonds (US Treasuries, German Bunds, Japanese sovereign bonds, etc.) as the senior most asset pledged as collateral for hundreds of trillions of Dollars’ worth of trades. The global derivatives market is roughly $700 trillion in size. That’s over TEN TIMES the world’s GDP. And sovereign bonds… including even bonds from bankrupt countries such as Greece… are one of, if not the primary collateral underlying all of these trades. Greece is not the real issue for Europe. The entire Greek debt market is about €345 billion in size. So we’re not talking about a massive amount of collateral… though the turmoil this country has caused in the last three years gives a sense of the importance of the issue. Spain, by comparison has over €1.0 trillion in debt outstanding… and Italy has €2.6 trillion. These bonds are backstopping tens of trillions of Euros’ worth of derivatives trades. A haircut on them would trigger systemic failure in Europe. In short, the EU’s worst nightmare is a debt haircut or debt forgiveness for Greece because it opens the door to Spain or Italy asking for similar deals down the road. And that’s when you’re talking about REAL systemic risk. Private Wealth Advisory is a WEEKLY investment newsletter that can help you profit from the markets: we just opened seven trades to profit from the above trends in the last two weeks. As we write this, ALL of them are soaring. MORE GREEK TRAGEDIES TO COME? Greece and too many other countries have been trying to defy gravity by living the good life on borrowed money. In 2001, the Greeks entered the eurozone, which gave them access to low-rate loans under the pretense that Greece was richer than it was. The seeds of the destruction that resulted in the closure of the banks this week were planted the day the Greeks adopted the euro. None of this should have been a surprise to anyone. The only thing for certain is that the Greeks will now suffer another major drop in their real incomes. The open question is will the Europeans, the Americans, the Japanese and others who also have been living on borrowed money, growing at unsustainable rates, learn the lessons from the latest Greek tragedy, or will they too march off the cliff? The United States, Japan, the United Kingdom, France, Spain, Italy, Russia, Brazil and a majority of smaller countries again this year will have lower rates of economic growth than the size of their current deficits as a percentage of gross domestic product (GDP) — causing a continued growth in the real debt burden. At some point these countries will have no choice but to cut expenditures or increase their real rates of economic growth to avoid becoming a future Greece. It is sad and striking how few countries, including the United States and most of the European countries, have real plans to reignite growth. Japan is in its third decade of little growth. Europe has stagnated for almost a decade, and the United States is only doing marginally better. Many on the left and so-called establishment economists, including many who work for the International Monetary Fund, World Bank and Organization for Economic Cooperation and Development, and politicians (plus, of course, the media) argue that the way to avoid a Greek-style debt crisis is to increase tax rates — while ignoring the basic fact that most tax rates on labor and capital in the major countries are well above the growth-maximizing rate. They argue, because of demographics and politics, that it is not possible to cut government spending despite it also being above the growth-maximizing level in most countries. Or in National Public Radio parlance, spending cannot be cut because there are “too many unmet needs” — which, by definition, are infinite. Switzerland, Hong Kong, Singapore and other places demonstrate how fallacious the argument that more government spending is needed because they have shown that it is possible to have a higher per capita income than the United States while having lower taxes and less government. And they manage to accomplish this without oil and other natural resources that the United States has in abundance. It is widely and correctly acknowledged that growth in regulations, particularly financial and environmental regulations, is serving as a major impediment to increasing economic growth. Yet, the Obama administration and its administrative agencies continue to crank out costly regulations at a record rate, without bothering in most cases to do serious cost-benefit analysis. The Republicans tend to decry the number and cost of the torrent of regulations, while doing little to stop them. Note that the folks who turn out and enforce all of the regulations are salaried government employees. If the Republicans, who now control Congress, would cut or even eliminate many of the regulatory agencies in government, they could bring a meaningful slowdown or even a halt to these destructive regulations. No employees = no bad regulations. Question: How many new regulations do we need? Almost all new regulations impose a cost on individuals, the economy and individual liberty. The Greeks and their fellow Europeans do not lack for regulations — so why are the folks in Hong Kong who have the greatest amount of economic freedom in the world so much better off? She could have substituted the “welfare state” for socialism to better describe today’s Greece, Europe and the United States. Total government spending as a percentage of GDP is 52 percent in Greece, 35 percent in the U.S., 33 percent in Switzerland, and only 18 percent in Hong Kong. Electing politicians who deliver (not just promise) less but more careful government spending, lower tax rates on labor and capital, fewer regulations whose benefits are unambiguously greater than the costs, and freer trade — along with a strong adherence to the rule of law and protection of private property — is the only way to guarantee not becoming a future Greek-like tragedy. Major health insurers seek eye popping rate increases for 2016 – 25 percent in Oregon, 30.4 percent in Maryland, 36.3 percent in Tennessee, 51.6 percent in New Mexico. Insurance commissioners won’t approve all companies ask for. Rates will rise modestly in some states. But the odds are your premium will cost a lot more next year. Premiums for non-group policies rose 24.4 percent more last year than they would have without Obamacare, says the National Bureau of Economic Research. Premiums in this market rose more after two years of Obamacare than in the 8 years preceding, sayseHealth Insurance, a private health exchange. Despite subsidies for the industry of at least $16 billion, many insurers lose money. Far fewer signed up for Obamacare than they expected (and the administration claimed). Those who did sign up are older and sicker. Subsidies for insurance companies mask the true cost, says Stephen Parente, director of the Medical Industry Leadership Institute. When they expire in 2017, premiums for the cheapest plan could rise nearly 100 percent for individuals, 50 percent for families, he says. That’s on top of sky high deductibles. The average deductible for the cheapest Obamacare plan is about $5,180 for individuals, $10,500 for families – four times the IRS threshhold for a “high deductible” plan. Patricia Wanderlich, who suffered a brain hemorrhage in 2011, skipped the brain scan she should have every year because her Obamacare policy has a $6,000 deductible. About 25 percent of Americans with private insurance can’t afford to pay a mid-range deductible ($1,200 for individuals, $2,400 for families), the Wall Street Journal said in March. People with a policy they can’t afford to use are no better off than the uninsured. Which may be why – despite the threat of fines – so few without insurance signed up for Obamacare. About 75 percent of those who did are subsidized. Subsidies could end for people in 36 states if later this month the Supreme Court rules for plaintiffs in King v. Burwell. As written, the ACA permits subsidies only for insurance purchased on exchanges “established by the state,” plaintiffs note. That was a drafting error, politicians he quoted told New York Times reporter Robert Pear. They’re lying. The words “established by the state” appear 9 times in the ACA. No “drafting error” is repeated that often. The words were inserted deliberately to induce states to set up exchanges, says MIT Prof. Jonathan Gruber, foremost architect of Obamacare, and Sen. Max Baucus, D-MT, who chaired the committee that drafted the ACA version that became law. Mr. Pear mentioned neither – par for the biased course at the New York Times. Let’s see if the Supreme Court can avoid such blatant bias. Obamacare is a cancer inside the body of health care in America — and it is metastasizing. Nearly every promise Democrats made has been broken. The average family pays more (some much more) for insurance, not $2,500 less. About 9 million Americans (so far) have learned they can’t keep their health plan if they want to. Or their doctors. Federal spending for health didn’t go down. It’s zoomed upward. So have emergency room visits. Overhead costs are exploding. Many employers say Obamacare is chiefly why 2.3 million fewer Americans have full time jobs than in 2007. The ACA has hurt millions more than it’s helped. The worst is yet to come. President Obama delayed or altered (mostly illegally) unpopular provisions at least 50 times. If they’re implemented fully, up to 100 million who get insurance from their employers could have their policies cancelled, the American Enterprise Institute estimated. As premiums and deductibles rise, and the job-killing employer mandate goes into effect, a “death spiral” – begun because so few healthy people have signed up – will accelerate. If the Supreme Court rules the ACA must be enforced as written, it would be a mercy killing. Jack Kelly is a former Marine and Green Beret, and was the Deputy Assistant Secretary of the Air Force during the Reagan Administration. He is the national security writer for the Pittsburgh Post-Gazette. “Did you know that if you took every single penny away from everyone in the United States that it still would not be enough to pay off the national debt? Today, the debt of the federal government exceeds $145,000 per household, and it is getting worse with each passing year. Many believe that if we paid it off a little bit at a time that we could eventually pay it all off, but as you will see below that isn’t going to work either. It has been projected that “mandatory” federal spending on programs such as Social Security, Medicaid and Medicare plus interest on the national debt will exceed total federal revenue by the year 2025. That is before a single dollar is spent on the U.S. military, homeland security, paying federal workers or building any roads and bridges. So no, we aren’t going to be “paying down” our debt any time in the foreseeable future. And of course it isn’t just our 18 trillion dollar national debt that we need to be concerned about. Overall, Americans are a total of 58 trillion dollars in debt. 35 years ago, that number was sitting at just 4.3 trillion dollars. There is no way in the world that all of that debt can ever be repaid. The only thing that we can hope for now is for this debt bubble to last for as long as possible before it finally explodes. “It shocks many people to learn that our debt is far larger than the total amount of money in existence. So let’s take a few moments and go through some of the numbers. “So if you gathered up all coins, all paper currency and all money in everyone’s checking accounts, would that even make much of a dent in our debt? “We’ll have to find more “money” to grab. “That is a lot more “money”, but it still wouldn’t pay off our national debt, much less our total debt of 58 trillion dollars. “So is there anything else that we could grab? 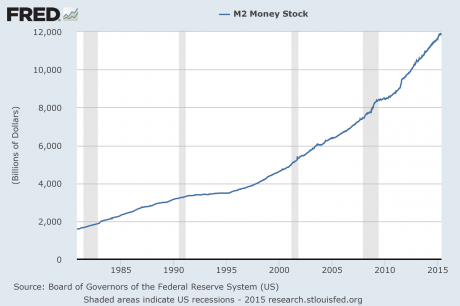 “The Federal Reserve no longer provides charts for M3, but according to John Williams of shadowstats.com, M3 is currently sitting somewhere in the neighborhood of 17 trillion dollars. “So even with the broadest possible definition of “money”, we simply cannot come up with enough to pay off the debt of the federal government, much less the rest of our debts. “That is not good news at all. “Alternatively, could we just start spending less than we bring in and start paying down the national debt a little bit at a time? “Perhaps that may have been true at one time, but now we are really up against a wall. Our rapidly aging population is going to put an enormous amount of stress on our national finances in the years ahead. “According to U.S. Representative Frank Wolf, interest on the national debt plus “mandatory” spending on programs such as Social Security, Medicare and Medicaid will surpass the total amount of federal revenue by the year 2025. That is before a single penny is spent on homeland security, national defense, paying federal workers, etc. “But even now things are a giant mess. We are told that “deficits are under control”, but that is a massive hoax that is based on accounting gimmicks. During fiscal year 2014, the U.S. national debt increased by more than a trillion dollars. That is not “under control” – that is a raging national crisis. “Many believe that that we could improve the situation by raising taxes. And yes, a little bit more could probably be squeezed out of us, but the impact on government finances would be negligible. Since the end of World War II, the amount of tax revenue taken in by the federal government has fluctuated in a range between 15 and 20 percent of GDP no matter what tax rates have been. I believe that it is possible to get up into the low twenties, but that would also be very damaging to our economy and the American public would probably throw a huge temper tantrum. “The real problem, of course, is our out of control spending. “During the past two decades, spending by the federal government has grown 63 percent more rapidly than inflation, and “mandatory” spending on programs such as Social Security, Medicare and Medicaid has actually doubled after you adjust for inflation. “We simply cannot afford to keep spending money like this. “And then there is the matter of interest on the national debt. 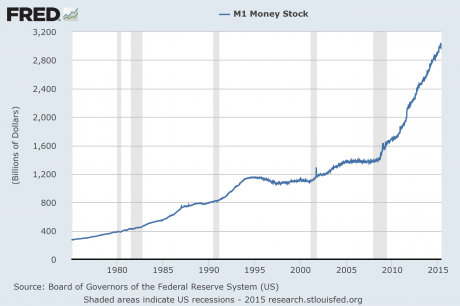 For the moment, the rest of the world is lending us gigantic mountains of money at ridiculously low interest rates. However, if the average rate of interest on U.S. government debt was just to return to the long-term average, we would be spending more than a trillion dollars a year just in interest on the national debt. “So the best possible environment for “paying down our debt” that we are ever going to see is happening right now. The only place that interest rates on U.S. government debt have to go is up, and our population is going to just keep getting older and more dependent on government programs. As the nation entered the 1980s, there was comparatively little debt—just about $4.3 trillion. That was only about 1.5 times the size of gross GDP. Then a funny thing happened. The gap began to widen during the decade, and then became basically parabolic through the ’90s and into the early part of the 21st century. “As I discussed above, there isn’t enough money in our entire system to even pay off a significant chunk of that debt. “So what happens when the total amount of debt in a society vastly exceeds the total amount of money? My note: Snyder doesn’t mention that Americans have over $19 Billion in pension plans. I believe that will be the next target. Just require all Pension plans to be invested in US Treasuries.